Tabula geographica agriculturae organicae (hectares). Organicus holerum mixtorym cultus Capay in vico Californiae. Vide magnam saepem in scaena. Holera per agriculturam organicam producta. Chloroxylon ad pestes temperandas in organica oryzae agriculatione in Chhattisgarh Indiae adhibetur. Vaccina, pro pecoribus sicut hae vaccae, partes magni momenti in salute animalium agunt, quia therapia antibiotica in agricultura organica prohibetur. Agricultura organica est alterna ratio agriculturalis, quae saeculo vicensimo ineunte orta est, responsum usuum agriculturarum rapide mutantium, hodie a variis societatibus agriculturalibus evoluta. Laetaminibus originis organicae nititur, inter quae sunt compositum, stercus, stercus viride, et ossa contusa; ac rotationem messium, sationem comitum, et alias artes exprimit. ↑ John Paull et Benjamin Hennig (2016), "Atlas of Organics: Four Maps of the World of Organic Agriculture," Journal of Organics 3(1):25-32. Ableman, M. 1993. From the Good Earth: A Celebration of Growing Food Around the World. HNA Books. ISBN 0810925176. Avery, A. 2006. The Truth About Organic Foods.' Henderson Communications, L.L.C. ISBN 0978895207. Beecher, N. A., et al. 2002. Agroecology of birds in organic and nonorganic farmland. Conservation Biology 16(6):1621–30. doi:10.1046/j.1523-1739.2002.01228.x. PDF. Brown, R. W. 1999. Margin/field interfaces and small mammals. Aspects of Applied Biology 54:203–210. Committee on the Role of Alternative Farming Methods in Modern Production Agriculture, National Research Council. 1989. Alternative Agriculture. National Academies Press. Emsley, J. 2001. Going one better than nature. Nature 410(6829):633–634. doi:10.1038/35070632. Gabriel, D., et T. Tscharntke. 2007. Insect pollinated plants benefit from organic farming. Agriculture, Ecosystems and Environment 118:43–48. PDF. doi:10.1016/j.agee.2006.04.005. Guthman, J. 2004. 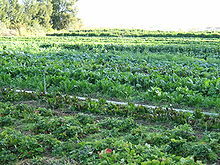 Agrarian Dreams: The Parodox of Organic Farming in California. Berkeleiae et Londinii: University of California Press. ISBN 9780520240940. Kuepper, G., et L. Gegner. 2004. Organic Crop Production Overview., ATTRA: National Sustainable Agriculture Information Service. Augusto. Lampkin, N., et S. Padel, eds. 1994. The Economics of Organic Farming: An International Perspective. Guildford: CAB International. ISBN 085198911X. OECD. 2003. Organic Agriculture: Sustainability, Markets, and Policies. CABI International. Textus. Paull, J. 2006. The farm as organism: The foundational idea of organic agriculture. Journal of Bio-Dynamics Tasmania 83:14–18. Paull, John. 2011. Nanomaterials in food and agriculture: The big issue of small matter for organic food and farming. Proceedings of the Third Scientific Conference of ISOFAR (International Society of Organic Agriculture Research), 28 Septembris–1 Octobris, Namyangju Coreae, 2:96-99. PDF. Markandya, A., et S. Setboonsarng. 2008. Organic Crops or Energy Crops? Options for Rural Development in Cambodia and the Lao People's Democratic Republic. ADB Institute Research Policy Brief 29. Tocii: ADBI. Smil, V. 2001. Enriching the Earth: Fritz Haber, Carl Bosch, and the Transformation of World Food. Cantabrigiae Massachusettae: MIT Press. ISBN 026219449X. Wheeler, S. A. 2008. What influences agricultural professionals' views towards organic agriculture? Ecological Economics 65:145–154. doi:10.1016/j.ecolecon.2007.05.014. Wickramasinghe, L. P., et al. 2003. Bat activity and species richness on organic and conventional farms: impact of agricultural intensification. Journal of Applied Ecology 40(6):984–993. doi:10.1111/j.1365-2664.2003.00856.x. PDF. Vicimedia Communia plura habent quae ad agriculturam organicam spectant. Novissima mutatio die 31 Octobris 2016 hora 22:34 facta.